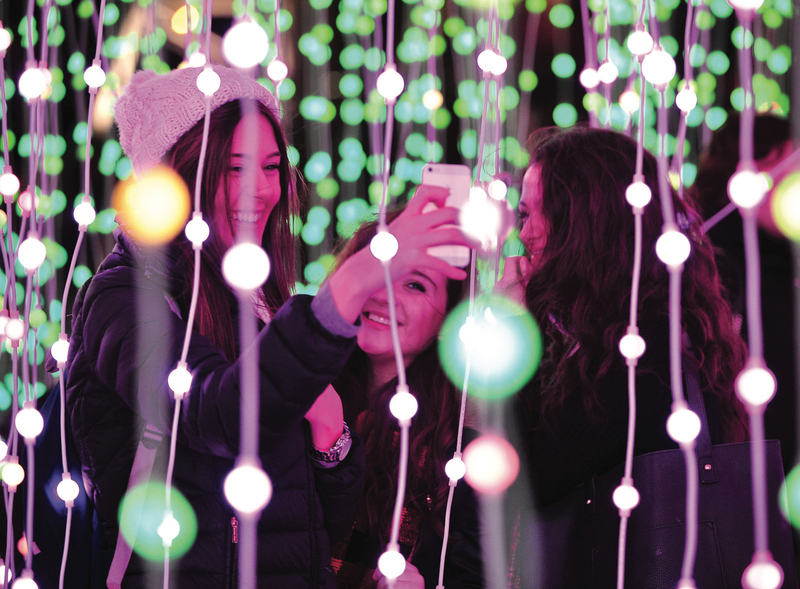 From November 2018 to January 2019, Kew Gardens will once again transform into a mesmerising illuminated trail of lights – one million of them in fact. After dark the landscape plays host to an explosion of newly commissioned artworks of light and sound that just keeps getting better each year. Visitors are invited to embark on a journey through the gardens for a truly unique winter experience the whole family can enjoy. The Royal Botanical Gardens, Kew is a world famous scientific organisation and has been a UNESCO World Heritage site since 2003 and celebrated its 250th anniversary in 2009. Respected internationally for its collections and scientific expertise in plant diversity, conservation and sustainable development in the UK and around the world – as well as being a major visitor attraction each year – Kew is home to 132 hectares of Landscaped gardens and wild botanic gardens. You may be interested to know what makes this place even more special is the Millennium Seed Bank which is now the largest wild plant seed bank in the world. This year promises a completely new experience created by a group of super talented international artists. The journey will begin with an archway that stands like a gateway into an incredible world of glistening lights and colour which leads you to the Field Of Light created by Brighton artists Ithaca. 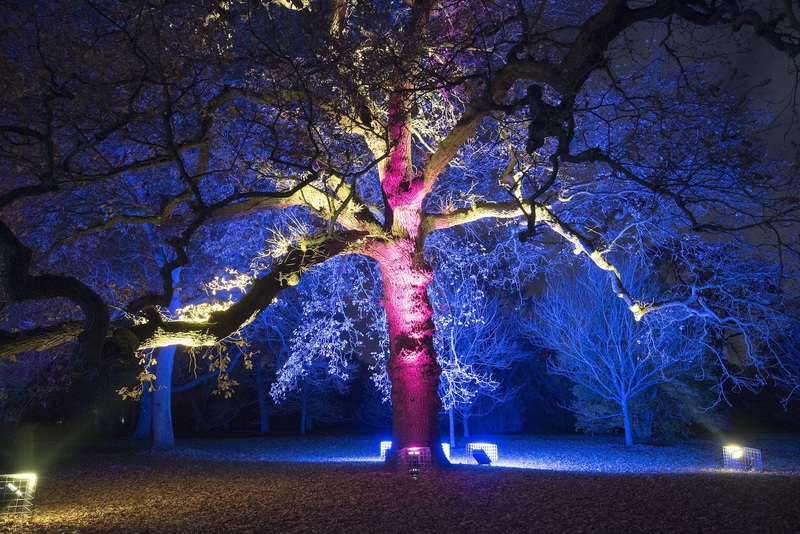 This will be a breathtaking spread of dancing lights that draw the eye towards Kew’s Great Pagoda. Next on the trail, visitors can enjoy the laser garden, by Australian creative studio Mandylights. The dancing beams of light will linger on the woodland trees before crossing the lake where you will see 300 illuminated origami boats floating on the water by Italian artists Aether & Hemera. 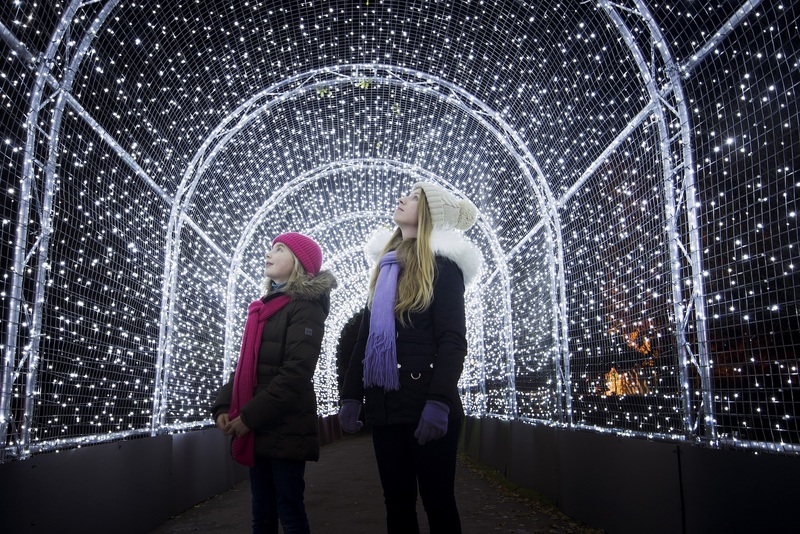 The famous tunnel of lights is a favourite each year at Kew but this year it will be taken to a completely new level, forming a Cathedral of light reaching 7m tall and 100m in length it will be the biggest tunnel of lights ever seen at the gardens. Visitors will then encounter an enchanted walkway of giant glowing peonies and papyrus, by French artists TILT, as well as the fire garden that leads to a huge dome of tubular lights inside where visitors can enjoy a festive drink. Kew’s great board walk borders – the world’s longest double herbaceous border – will be flanked by beautiful towering 11m high flower sculptures, and by illuminated benches where visitors can relax and admire the view along the promenade. 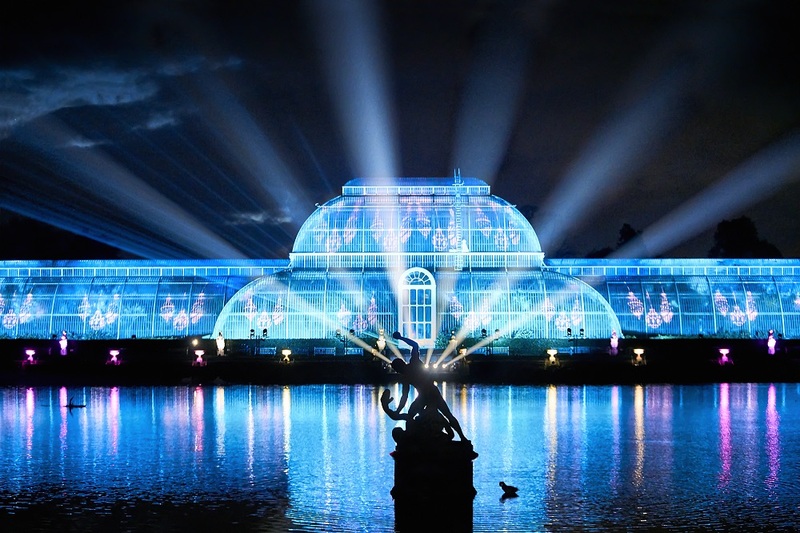 It wouldn’t be Christmas as Kew without an incredible show-stopping Palm House Finale. The pond and impressive glasshouse is brought to life with criss-cross laser beams and kaleidoscopic projections that dance across the giant water screen. As the winter trail comes to an end, smells of mulled wine, mince pies and festive food from a variety of stalls will greet you at the Victoria Plaza. The trail is open from Thursday 22nd November 2018 – Saturday 5th January 2019. Timed entry every 30 minutes from 5pm-10pm. 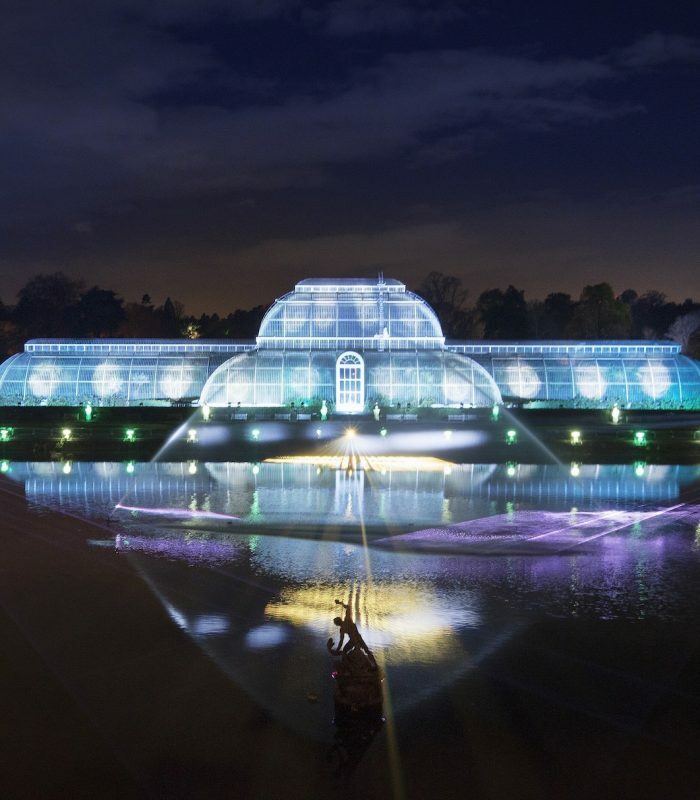 For more information about Kew Gardens visit the website here, or to purchase tickets for the light trail click here. Images: Raymond Gubbay, Jeff Eden, RGB Kew.